The stock market experienced a wild ride over the past week. 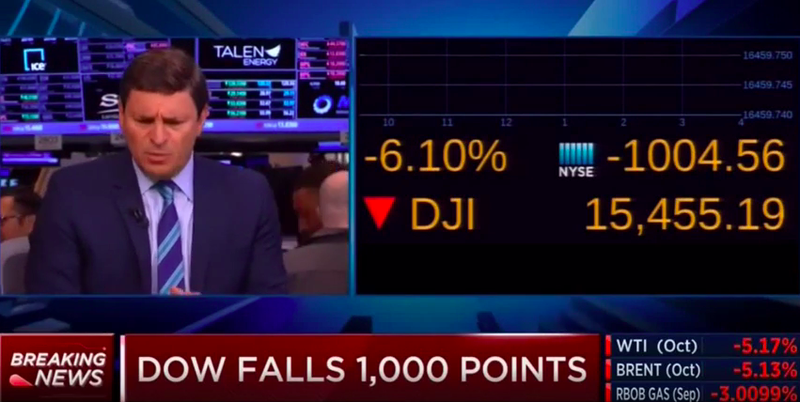 On August 24, 2015, the DOW dropped over 1,000 points at the open due to week economic news in China and also due to crashing crude oil prices. While 1,000 points sounds like a lot, it really amounted to a temporary 6% loss. By the end of the trading day, the DOW ended up down 588 points. At one point, the US stock market was down over 10% from its most recent highs. Our own investment portfolio lost over $15,000 in 5 days. A friend called me to ask if it was time to sell some stocks. Many Boglehead forum users made posts asking what to do with this stock market crash. Panic was starting to set in for many people. Then on Wednesday, August 26, the DOW jumped 619 points. On Thursday, the DOW jumped 369 points. On Friday, the DOW barely moved with a drop of 11 points. In those three days, our investment portfolio returned $8,500. We haven’t sold any of our funds. In fact, we put in orders to buy more shares at 10% off their normal prices. Remember that a 10% drop in the market one day, followed by a 10% rise in the market the next day does not mean that you are back to where you started. I was thinking about writing a response to the latest market volatility and then I remembered that I have previously written about this very topic! Stock market drops are nothing new, they happen all the time. I wrote about staying invested back in October 2014 here. Everything I’ve said is still valid. I’ve copied and pasted what I’ve written below. We have our investments exactly how we want them to be. We won’t be selling our funds. In fact, we’re buying up more shares on sale while we can. The stock market will go up and the stock market will go down, this is a fact. The problem with trying to time the market is that it can’t be done reliably or consistently over time. Research consistently finds that investors who buy and hold their investments end up with a lot more wealth than those who panic and sell when their investments start to lose value. Investors who sell in a panic tend to also be the type of investor that only start buying more stocks once the market starts to rise in value (and get much more expensive). To truly properly time the market, you need to be right two times: when to get out, and then when to get back in. Making one, or both mistakes can be costly. Research shows that typical mutual fund investors perform much worse than the mutual funds they invest in. This is because they tend to buy after a fund has done well, and sell after the fund has done poorly. Buying high and selling low is a recipe for poor performance. If you are not ready to ride out the market’s volatility, you should not hold a large portion of your assets in stocks. This being said, the stock market always goes up over time. The stock market does just as well whether you are out of the market as when you are in it. As it turns out, the best returns on the stock market have happened in only a few months. The returns on the very first few weeks of a market recovery produce a large proportion of the total gains that will be experienced. If you’re sitting out on the sidelines of the stock market waiting for the right time to get back in, chances are that you will miss your opportunity. Simply buying and holding your investments is more likely to outperform market timers with a lot less headache along the way. Your investment losses will recover. When the stock market is losing money, this is your time to pick up more shares at cheaper prices. Stocks can be volatile with up and down swings, just like a roller coaster. When you’re riding a roller coaster and you get scared, you should hold on tight, not jump out of your seat. We are investing in a simple Boglehead 3 fund portfolio. Our current asset allocation is made up of 90% stocks (70% domestic stocks, 30% international stocks) and 10% bonds. Our 401K funds are set up to mimic Vanguard’s Total Stock Market index fund. This portfolio is easy to manage and we sleep well at night not worrying about the volatility of any individual stock. With our 3 fund portfolio, we essentially own a piece of over 3,600 US stocks (like Apple, JP Morgan Chase, Google, and Chevron), over 5,500 International stocks (like Nestle, Toyota, HSBC, and Samsung), and over 6,300 individual US Bonds. With dollar cost averaging, you invest equal amounts of money regularly over a specific period of time, instead of all at once. When you dollar cost average, you buy more shares when prices are low and less shares when prices are high. Investing this way will reduce the chances of putting all your money in just before a market crash. It will also allow you to stay invested if the market does crash. When you are investing for the long term (over 10 years), it doesn’t really matter if you are buying at the exact bottom of a market crash. Any stock market crash will be followed by a recovery. Staying invested will keep your portfolio part of the rebound.